A blog of inspiration and encouragement for all writers. Winner of a 2014 Silver "Ippy" Award. 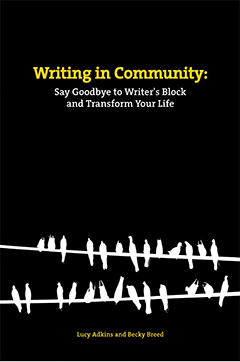 "Losing the Ring in the River"
"These writers ... write ideas that are fresh and new with profound potential... ." - Mary Pipher, author of "The Green Boat" and "Writing to Change the World"
"Reading this book is inspiring me to write more." - Sue Patton Thoele, author of "The Mindful Woman" and "The Courage to Be Yourself", among others. Led by Lucy Adkins, “Finding the Writer Within”, will be held Sunday, March 31st, 1:30 – 3:30, at Spring Creek Prairie. Registration is $40 with a portion of it provided as a donation to Spring Creek. Explore the world of writing in this workshop of inspiration and encouragement designed to help each participant find the writer within. Together, we will tap into the world of imagination, learn ways to jumpstart the creative process, and working from writing exercises, shared images and structured walks on the prairie, we will do our own writing. In addition, we’ll discover insights into ourselves and the practice of creativity, and discuss ways to make the practice of writing a part of our lives. Whether you are a beginning writer or one with many publications to your credit, this blog is your invitation to join the writing community. Our wish is that it will serve as a source of inspiration and encouragement, and that it will help you reach deep within and write to your fullest potential. Welcome!